Now that I blathered on about Fort Steele for so long I will see if I can fit the rest of our trip into one post so as not to totally bore you guys. Hubby and W wanted to go mountain biking in Fernie. 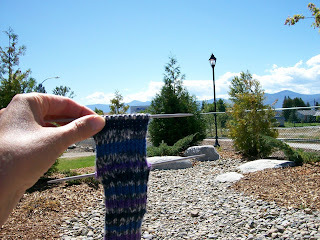 Fernie is beautiful so I thought that E and I would hang out at the Rotary park, check out the thrift stores and maybe have a treat (coffee for me and ice cream for him). On the drive there I started noticing cattle trucks driving past us heading towards Cranbrook or Vancouver. There seemed to be so many that I started counting and when I got to around 30 I stopped. Truck after truck filled with cows and covered in cow crap. It was disgusting, really, and I think it even bothered S who does eat meat. I'm not sure where the trucks were all coming from, I would guess around Lethbridge area, but this was only during about one hour of one day that we were on a section of road where they were heading opposite us. I know that the number of cows North Americans eat is incredibly high but to actually see this visual reminder of it was really disturbing. It kind of bummed me out for the day and the boys got to listen to another little rant about fast food places and the typical lousy North American diet. Once we got to town, S dropped us off in front of the thrift only to find that it was closed. Bummer! Anyway, they had a great time mountain biking, E liked his ice cream and I got to sit at a main street cafe, knit, drink coffee and look down at a street filled with lovely old buildings. 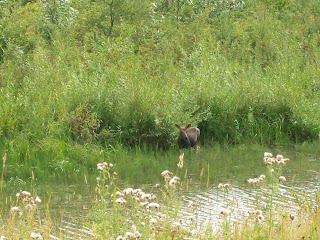 On the way out of town we saw a young moose munching away. 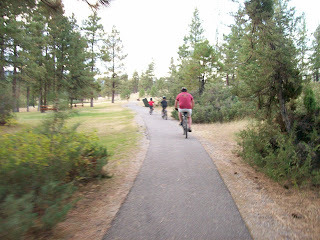 We were camping at Wasa Lake in part because we love the bike path, done by the Lion's club, that goes around the whole lake. 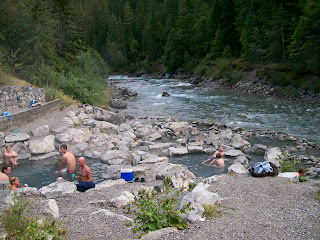 And since we were so close and because we always do, we had to head to Lussier hot springs. These are a natural hotsprings alongside a river. 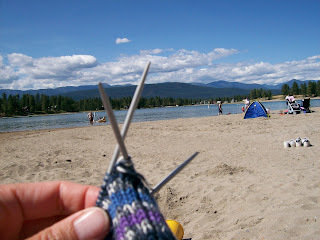 We headed towards Nelson to our next campspot but had electrical troubles in Creston. Our trailer battery was on its last legs so our fridge wasn't working. We didn't want to buy a new one because we had some at home that someone had given us. When we stopped to get some groceries we discovered that our lights on the trailer weren't working so had to try to sort that out. 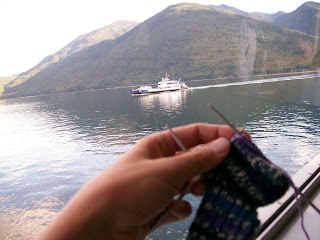 Since Nicola and Samantha are fans of Yarn Harlot I decided to take some pics for them. I don't know if you can see it but that is the Columbia brewery in the background. I guess there are worse places to be stuck than by a brewery heh? By this time W felt like he had a cold coming on so we headed back to the campground and relaxed. We tend to find that after day 9 of camping we are all ready to go home. 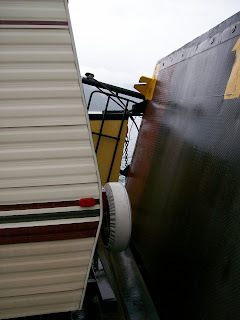 We got packed up early the next morning and headed out towards Nakusp planning to take the road home through to Lumby even though it is not a pleasant road with a big truck and trailer. Just before Nakusp something starting going wrong with the truck and by Nakusp it was gasping and stalling. Not good. Nakusp on a raining, cloudy Sunday morning is not a place you want to have vehicle troubles. While I sat there nervously thinking that we would either meet our deaths by stalling on the road to Lumby with no room to pull over or have to spend another night camping, S tinkered around a bit and decided it was the grungy air filter that was the trouble, it seemed to run well without it, so the plan was to drive without it to Revelstoke in the hopes that there would be something open there to sell us one (silly us). We wanted to stay on the straighter road to Revelstoke instead of the windy road to Lumby just in case we stalled again. While we waited at the ferry I took the boys to use the bathroom (what is it with public toilets? People, the let it mellow thing does not apply in public toilets, flush for pity sake, flush. I am going to avoid public toilets for at least a month...9 days worth of them is enough), E found a twoonie on the way back up to the truck and so he felt that meant our luck was changing. The ferry arrived and it was looking like we would not get on, in fact, the bar right closed in front of us but then the ferry guys decided we would fit on. We drove on a bit doubtfully, me thinking it would not be fun to have to back up off the ferry and up the entrance ramp in reverse with a truck in turmoil. They squeaked us on and had to get the van in front of us to pull up further so that they could shut the back ramp. It was a close one. We stopped in Revelstoke and had lunch at a great little cafe called the Nomad Food Co., the same one we had had dinner at 9 days earlier at the start of our trip. Revelstoke did not have the part we needed so we drove home chugging, lurching and gasping, all the while cursing the guys in the service department who had done a service on the truck three weeks earlier. About a mile from home we chugged, gasped and stalled again but managed to make it. It is good to be home. Whew! Quite the adventure, Heather! Glad you had such a good time and made it home safe. So, will you be staying put for awhile? Thanks so much for sharing your experiences with us - more ideas of where and where not to travel. There's just so much to see in this lovely province! Glad you made it home OK! 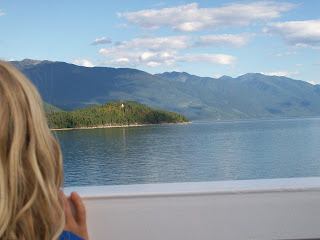 We loved Crawford Bay, Nelson and the Kootenay Co-op too! 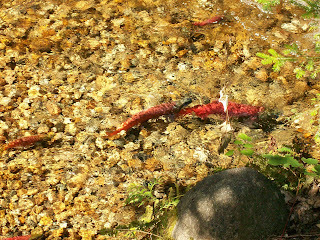 And we liked Sandon too, though only for a one time visit. R and L are in Cranbrook today and I was amused to find out that they had driven SO far that they were actually in a different time zone!